Jelly refers to those desserts that are liked by both adults and children. It is made from fruit juices and broths, dairy products (milk, cream, cottage cheese and sour cream), which is injected gelatin. - 1 packet of gelatin. Connect the sour cream with sugar and whisk very well until the volume is doubled. Prepare gelatin. To do this, soak it in cold water for 40-60 minutes, then bring to the boil and refrigerate. Pour the cooled gelatin in a thin stream in the sour cream mass. Stir, pour into molds or kremanki and put to harden in refrigerator. If desired, when serving graviola jelly can garnish with fresh berries and fruit. Peel the bananas and mash them thoroughly with a fork, grate or chop in a blender. Instant dissolve gelatin in strong tea. Then add to the banana puree sour cream and gelatin. Mix well. 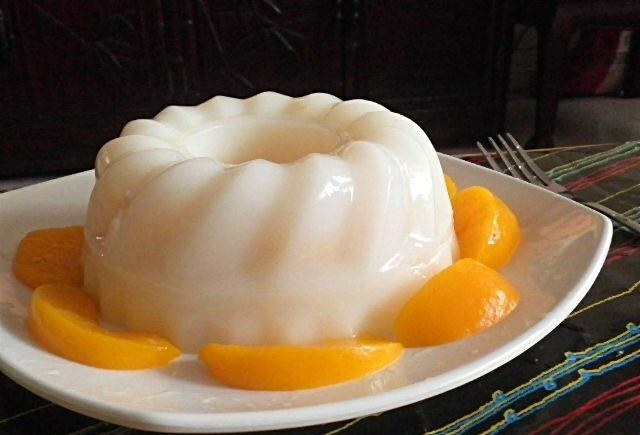 Put the cooked jelly into molds and put for half an hour in the fridge to solidify. Before serving, sprinkle graviola jelly with grated chocolate. - 20 g of gelatin. Very carefully whisk the sour cream with sugar. Mash the raspberries and strain the resulting juice through cheesecloth. Gelatin pour 200 ml of cold boiled water. Give him 40 minutes to swell and dissolve in a water bath. Then, add the gelatin to the raspberry juice and mix together with whipped with sugar and sour cream. Put the prepared mixture is dipped into cold water molds and place in the fridge to solidify. Just before serving, place the ramekins for a few seconds in hot water and then invert the contents on a dessert plate. Decorate Jell-o with raspberries. - 2-3 tbsp of cocoa powder. Mix cottage cheese with sour cream and powdered sugar. Soak the gelatine in ¾ Cup of cold boiled water, after about an hour, dissolve it in a water bath. Then, add the gelatin in cottage cheese and sour cream mass and mix thoroughly, divide it into 2 parts. In one put vanilla, in another cocoa powder and stir well every. Take the mold and pour into it one at a time 2 tablespoons of the cooked mass. When it runs out, put the jelly in the fridge for 5 hours.